When the Conquistadors arrived in 'Mexico, the Aztecs had not as yet developed a script in our sense. The news of the white men’s arrival was brought to Montezuma by his envoys in the form of a series of pictures, each telling an episode of the story. They were very much like strip cartoons, and even showed speech issuing from the persons’ mouths. However, since they had no script, the speech scrolls of the Aztecs remained empty. A few of these pre- Columbian ‘codices’, as they are called, have been mercifully preserved but most of them were burnt by the pious Spanish friars who felt that these were works of the devil. Even if they had been preserved, it is doubtful whether the codices could have told us much about Mexican history. The Maya had developed writing earlier, and calendrical glyphs on some early stelae appear to record dates corresponding to the beginning of the Christian era. Whether later glyphs - which we cannot decipher - represent a spoken language, we do not know. One may suspect that, like the Aztec codices, they are mainly inventories. It is too rarely realised that writing was not invented by the philosophers and poets but by the accountants. The treatment which the codices suffered was shared by almost every item of Mexican religious art that was in existence at the Conquest. A few objects were sent by Cortes in 1519 to the Emperor Charles V and in the following year exhibited in Brussels. The great German painter, Albrecht Diirer, travelled from his native Nuremberg to see them and left us a description in his notes. He was full of admiration for this strange art, the power of which he recognised immediately. His appreciation was probably shared by only a few others since most of the objects have since been lost or destroyed. A small number of them, fortunately, found their way to the British Museum where they form some of its greatest treasures. Otherwise almost nothing was left undestroyed at the Conquest and the large collections in the magnificent Anthropological Museum at Mexico City are all archaeological finds, most of them of fairly recent date. In the absence of a script or of a key to the Maya glyphs, the eartn of Mexico has to provide all the information of America’s prehistory. Aztec legends that were collected by the early Spanish historians are vague, even about the preceding two centuries when their bloodthirsty humming-bird led them into the Valley. The earliest civilisation which their myths could recall was the legendary Tollan, the capital of a people called Toltecs. Archaeologists have since recognised the remains of Toltec art over a wide region of Mexico, from the Valley to Yucatan. Quite recently the site of ancient Tollan has been identified with the town of Tula in the province of Hidalgo. It seems to have flourished between AD IIOO and 1300. As for Teotihuacan, the Aztec legend had nothing to record and when the Spaniards asked the Mexicans who had built the pyramids and the Street of the Dead, they replied : ‘the gods’. Man probably appeared on the American continent during the last glacial period, perhaps 50,000 years or so ago. With so much of the water locked up in the huge ice sheets, the level of the oceans was lower than today and it may have been comparatively easy to cross the Bering Strait from Siberia to Alaska. That, as it seems, was the route taken by the hunting nomads who were, most likely, related to the Mongolian races of East Asia. Moving gradually south, some of the nomads became sedentary and developed agriculture, based on a grass from which they bred the maize plant, perhaps in the Gila valley of Arizona. As yet we know little about these early times but it seems that the first Amerindian civilisation may have blossomed at the shore of the Gulf of Mexico. There a people whom we call ‘Olmecs’ established culture centres in which they left a peculiar type of sculpture, characterised by gigantic stone heads and a strange form of portraiture in which the upper lip was drawn up. These ‘baby faced’ figurines occur together with representations of the jaguar which evidently was regarded as a divine animal. While it is quite possible that tomorrow’s dig may turn up evidence for a precursor of the Olmec culture, we can do no better at present than to regard the early settlements on the Gulf as the cradle of Amerindian civilisation. One of the most important sites near a village called La Venta evidently served as a cult centre for the agricultural population of the neighbourhood. Just like the original followers of Horus in Egypt, the Olmecs of La Venta exhibited a number of accomplishments about the origins of which we know nothing. Two features, in particular, stand out; they built cult mounds and they had sufficient astronomical knowledge to establish a calendar. 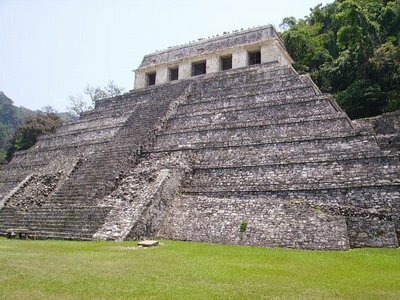 Both these achievements were passed on to the Mayas of Yucatan and to the Valley of Mexico. So far we have said nothing about the time when this early civilisation came into being. In the absence of any historical records archaeologists have had to rely on the artefacts that were dug up, particularly the little clay figurines which are so typical of Central America. Classifying their styles and correlating their location had for many decades been the only guide by which archaeologists, men like Caso, Linne, Noguera and Vaillant, tried to establish a sequence of dates. It was an undertaking of great complexity, full of uncertainties and pitfalls. Worst of all, it did not lead to any form of exact dating and often the experts’ opinions on one and the same site differed by quite a few centuries. All this was suddenly changed by nuclear physics. In 1949 Professor W. F. Libby of the University of Chicago developed a radioactive test which permitted the age of organic deposits, such as wood or bone, to be determined with remarkable accuracy, and for which he received the Nobel Prize in i960. The method is based on the radioactive decay of carbon nuclei with the atomic weight I4,(14C). Almost all the carbon existing in the earth’s atmosphere as carbon dioxide has nuclei with weight i2,(nC), which are inactive, and only one part in a million million is made up of the radioactive 14C. The origin of the 14C is due to neutron bombardment of atmospheric nitrogen (14N+n l4C), the neutrons coming from the cosmic radiation impinging at a steady rate on our planet. The newly created 14C nuclei are unstable and in due course revert to ordinary nitrogen by emitting a beta ray (14C->14N+/S). In this way the concentration of radioactive 14C in atmospheric carbon dioxide is kept constant, being continually created from atmospheric nitrogen and continually destroyed by ito own radioactive decay.